Laser hair removal is widely considered to be the most efficient method of hair removal, however it doesn't come without its drawbacks. One of the biggest areas of contention with laser hair removal treatment is whether it can be used on people with darker skin. Historically, early generation lasers for hair removal were not suitable for people with ethnic skin or 'skin of colour'. There has been a significant amount of research to suggest that using one of these early generation laser devices on such skin tones was not safe due to a high risk of hyper pigmentation and scarring. However, over the last decade, new laser types have been researched and introduced to the market. These new lasers operate at a different wavelength to the early generation ones and are said to be safer for patients with skin types IV to VI on the Fitzpatrick scale. Why is Laser Hair Treatment on Dark Skin More Risky than Light Coloured Skin? Laser hair removal works by targeting a substance called melanin that is responsible for pigmentation in hair. The darker the hair, the higher the concentration of melanin. However, melanin is also responsible for pigmentation in skin - this is called epidermal melanin. The concentration of epidermal melanin increases in correlation with the darkness of the skin - therefore people who have skin tones of V and VI on the Fitzpatrick scale exhibit the highest concentration of epidermal melanin. When a patient has high amounts of epidermal melanin, the absorption of laser energy by the target hairs can be compromised due to it being absorbed by the melanin in the skin. ​ Not only does this mean that the hair removal is less effective, but it can also lead to burns, hyperpigmentation and scarring. Over the last decade, the laser hair removal field has had a lot of research leading to the discovery of new laser types. One of these new laser types is called the Nd:YAG laser. It's a laser that operates at a much higher wavelength than any of the other lasers that are used for hair removal (typically 1064nm). The question is:- "How much research has been done into the efficacy and safety of using the Nd:YAG laser for hair removal on people with Fitzpatrick skin types of IV to VI?​"
​In 2012, a study was undertaken with 39 female patients that all undertook laser hair removal with the Nd:YAG laser on their underarm (Axillary hair removal). All women had skin types of between IV and VI on the Fitzpatrick scale. This meant that their skin ranged from "light / moderate brown" to "dark brown / black" in colour. This is the first piece of evidence that demonstrates the Nd:YAG laser as being effective and safe in laser hair removal for darker skinned patients. My only note of caution is that I wasn't able to find out a breakdown of the number of patients by skin type so we don't know how many of the participants had Fitzpatrick scores of V or VI. In a study published by Nanda et al in 2010, 200 consecutive female patients underwent Nd:YAG laser hair reduction on their face. Each participant had 6 sessions done - the interval period between the sessions hasn't been specified in the abstract, though. 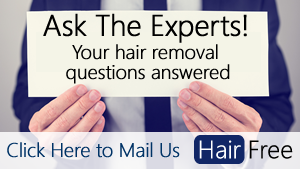 The results revealed that there was more than a 50% reduction in hair count in 72% of cases. None of the patients experienced a higher hair count and only temporary side effects were noted. The study concluded that "​long pulsed Nd: YAG is a very safe and effective means of hair reduction in skin types IV and V". My main reservation with this study is that no patients had Fitzpatrick VI skin type so we don't have any data of the Nd:YAG efficacy and safety for people with the darkest skin colour. 20 women received Nd:YAG laser hair removal on dark brown to black terminal hair on the face, underarms and legs. The study concluded that:- "​The long-pulsed 1064-nm Nd:YAG laser is a safe and effective method of long-term hair reduction in patients with darkly pigmented skin." "The vast majority of published data pertaining to lasers and light treatments in nonwhite skin involve patients of East Asian ethnicity (e.g. Korean, Japanese, Chinese, Thai). By contrast, there is a paucity of studies involving individuals of African ancestry or those with SPT V or VI"
User a longer wavelength - the Nd:YAG laser is preferred over other types of laser due to the fact that it operates at a longer wavelength. Active epidermal cooling - modern lasers often come with a skin cooling device. These have been shown to minimise both pain and side effects from laser hair removal on darker coloured skin. User longer pulse durations - longer pulse durations have been shown to be safer for patients with darker skin colour. As a consumer of laser hair removal it is not your job to understand the laser hair removal process at this level of detail. I've added these details here merely for your knowledge, so that you can ask the right questions when going for an initial consultation. In Conclusion: Is Laser Hair Removal Safe on Patients with Darker Coloured Skin? The Nd:YAG laser is the only laser that is specifically catered for use on patients with dark coloured skin and thus It is the only laser that should be used on skin types V and darker. All scientific studies looking at the efficacy and safety of the Nd:YAG laser on dark coloured skin are positive. In every study I've read the side effects were minimal and temporary. Furthermore, hair reduction counts were impressive, ranging from 50% at 3 months after the final treatment right the way up to 70-90% at 12 months after the final treatment. In Conclusion:- The evidence shows that laser hair removal for people with dark skin is both effective and safe as long as the Nd:YAG laser is used with a lower fluence and extended pulse duration. Despite the studies, if you have dark skin then you are inherently more at risk of unwanted side effects than someone with light coloured skin if the treatment is performed incorrectly. There have been studies to show that skin type VI may absorb as much as 40% more energy when irradiated by a visible light laser than does skin type I or II when fluence and exposure duration remain constant. If the laser operator doesn't reduce the fluence, extend the exposure duration and use adequate cooling then you are at risk of unwanted side effects that include permanent pigmentation damage and scarring. ​Therefore, it is really important that you, as a consumer, do your homework to make sure that the laser operator is proficient. Lasers and light-based therapies in ethnic skin: treatment options and recommendations for Fitzpatrick skin types V and VI. Long pulsed Nd:YAG laser with inbuilt cool sapphire tip for long term hair reduction on type- IV and V skin: a prospective analysis of 200 patients. Hair removal on dark-skinned patients with pneumatic skin flattening (PSF) and a high-energy Nd:YAG laser. Long-pulsed Nd:YAG laser-assisted hair removal in pigmented skin: a clinical and histological evaluation. Hello David! I am so glad you did an article (with backed up research studies included) on Laser Hair Removal’ for people with more melanin(carbon) in their skin. I was amazed to find out that people with darker skin tones have a higher concentration of Melanin in their DNA. Melanin absorbs UV and is thus a natural sunscreen, and is probably the reason that dark skinned people have a tenth of the skin cancer rate of fairer folks. UVA radiation causes lesions or DNA damage to melanocytes, which are the skin cells that produce the skin pigment known as melanin. Melanin is a protective pigment in skin, blocking UV radiation from damaging DNA and potentially causing skin cancer. I bought the original Tria Hair removal device. Overall pleased but as i am post menopausal, the hair on the sides of my face has gotten thicker (not like normal peach fuzz) and since it is blond/gray, the Tria wont detect it, or remove it. I read an article and TRIED this, where u remove the hair using a cream product, the rub a liquid Carbon Dye (obtained from Amazon) into the pores so the laser can detect the follice location. Then after my Tria session, i had to remove it using the alcohol in hand sanitizer. I cannot see that this worked. Have u heard of this and / or do you know of any other options to get rid of the lighter colored hair? My skin is very fair. Im 51, and do color the hair on my head. I live in FL so when i am in the sun, this heavy peach fuzz is very noticeable and embarrassing. I also dont know the difference in the older Tria i have and their 4x. In all my research, it looked as if the older one has an 800 diode laser and the 4x has an 810 diode laser? Is that true and if so, would that even make a difference in results or is it just “marketing” a new or improved item? Thanks for your help. Hello Tammy, can you point me to the article that makes the liquid carbon dye suggestion? It’s the first I’ve heard of such a thing and would like to consult some professionals and do some research on it.